I’m struck by what Geoff Livingston titled his book from 2007. “Now is Gone”. It almost seems prescient. Content is content just for a day and almost seems irrelevant if it is from last week. Social sites are only as good as the purpose they serve right now. 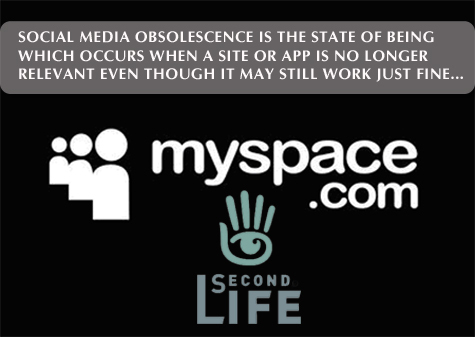 Fame is fleeting, personal brands last only as long as your last Google update and social networks continue to evolve. What does this mean? When a social site no longer serves the needs of the people that participate, those people move on. Though there might not be a thing wrong with it. The site has become obsolete. This entry was posted in social media and tagged marc meyer, Myspace, second life, social media, Social Networks by marc meyer. Bookmark the permalink.